The Myconian K Hotels and Thalasso Spa Center (Kohili-Korali-Kyma-Kalypso) are perfectly positioned, only 10 minutes walk from the cosmopolitan Mykonos town. Our charming star Mykonos town hotels are ideal for all walks of life, whether blossoming honeymooners or families looking to enjoy some time together. The best part is that you will experience really authentic Myconian hospitality with this family-owned and privately-run Mykonos Town hotel, which was fully renovated in 2008. Among the facilities at our charming star Mykonos hotels there are various spacious lounge areas and bars overlooking the town of Mykonos and the famous windmills. Carefully chosen cuisine, large verandas overlooking the multilevel swimming pools, magnificent views and the smiles of a perfectly trained staff are characteristics of a fine superior three star hotel. In fact, it perfectly describes the Myconian K Hotel collection of 3 star hotels in Mykonos. Town. Please visit our other Mykonos Boutique Hotels members of The Leading Hotels of the World and the Relais Chateaux. 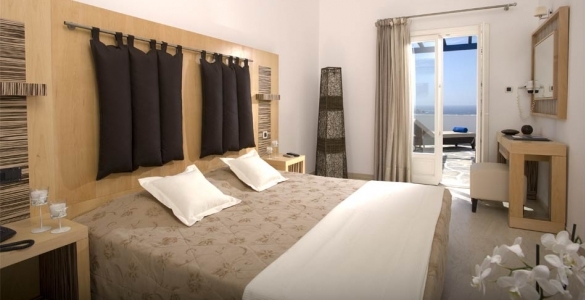 All 156 Mykonos hotel rooms are designed to a high and modern standard, comfortable and are fully equipped with satellite TV, mini fridges, direct dial phones, individual A/C hair dryers and safes. We also have a variety of things to do while staying at our Mykonos Town accommodation. Relax and unwind at the Satory Thalasso Spa Center or at the outdoor Jacuzzi overlooking the Aegean sea. Work towards a healthier you at the gym or play a match at the tennis courts. Windmills - Mediterranean Cuisine - Veranta Snack - Light snacks - Veranda Pool Bar - Cocktail Bar - Oniro Bar - cocktail bar - outdoor terrace. Είστε ιδιοκτήτης ή διευθυντής στο MYCONIAN K HOTELS; Εγγραφείτε τώρα για δωρεάν εργαλεία, που μπορείτε να χρησιμοποιήσετε για να βελτιώσετε την καταχώρησή σας και να συνδέσετε την ιστοσελίδα σας και το σύστημα κρατήσεών σας.